Could not load file or assembly 'file:///' or one of its dependencies.The system cannot find the file specified. 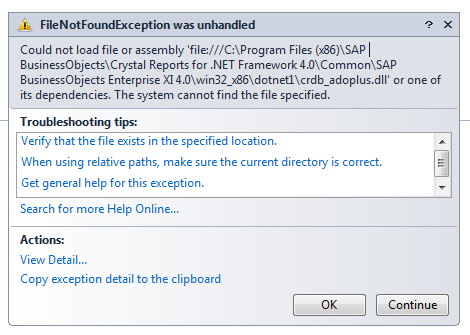 Here I will explain how to solve the problem of “Could not load file or assembly 'file:///C:\Program Files (x86)\SAP BusinessObjects\Crystal Reports for .NET Framework 4.0\Common\SAP BusinessObjects Enterprise XI 4.0\win32_x86\dotnet1\crdb_adoplus.dll' or one of its dependencies. The system cannot find the file specified.” while using crystal reports in windows applications in C#, vb.net.